We have a long and specific experience on this field. Come and visit us to see what we do and to test us! In modern industry SCREW CONVEYORS are often used horizontally or inclined or vertical as an efficient way to move bulk semi-solid materials. Among them food waste, wood chips, aggregates, store of cereals and grains, animal feed, meat and bone meal, urban solid waste, and many others. Screw conveyors are capable of handling a great variety of bulk materials from sluggish to free-flowing, that can be conveyed and distributed to various locations as required. Equipped with accessories such as slide gates or valves, that can be added to control material flow and that are very compact and adaptable to congested locations. and industrial use and tops exports with 80% of production worldwide . corn , flour , mud , dust , sand , semisolids , gravel , etc. .
and processing of inert materials or ceramic. 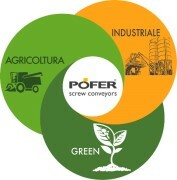 Pofer Ltd. has over 30 years experience in design and production of screw conveyors for agricultural, industrial and biomasses applications. We provide screw conveyors made for transporting and mixing a wide range of materials: corn , flour , sludge, dust , sand , semisolids , gravel , etc, which are used in different industries: agriculture, food , energy (biomasses ) , ecological, chemicals, plastic and processing of different materials and aggregates.